Every race has one unit with the ability to transform a basic unit from a different race to change sides. For the Sapien race, the Engineer can transform the Titan Mecha. For the Khralean race, the Infector can transform the Sapien Marine. For the Titan race, the Assimilator can transform the Khralean Underling. These units must be next to the enemy unit in order to transform. To transform, select from the Action Menu Re-Program as the Engineer, Infect as the Infector or Assimilate as the Assimilator. Once units have been transformed they cannot change back. The units that can cause transformation also have special abilities that will affect units of a specific race that are within range. When these abilities appear in the Action Menu, highlight them to view the range and select them to activate. 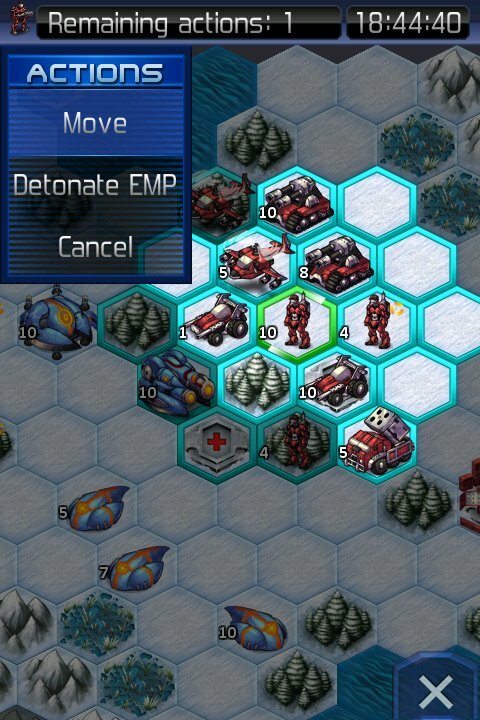 The EMP will disable Titan units within range for one full round, allowing others to attack them without taking damage. The UV will deal one point of damage to all Sapien and Khralean units within range. The Plague will poison nearby Sapien units for the remainder of the game until the units repair at a Medical terrain or next to an Engineer. At the beginning of every turn for the infected player those poisoned units will lose one point. Any units that are next to a poisoned unit at the start of the unit will catch the plague and be poisoned as well. Attack the same enemy twice or more during the same turn to gain an attack bonus. This GangUp Bonus varies depending on the location of the first attacking unit and the following attacking units. To gain a small bonus, have an attacker next to the first attacker or have one of your attackers fight long range. For a better advantage, have the second attacker further around the enemy unit. To gain the best advantage, have the next attacker behind the enemy unit on the opposite side of the first attacker.